Marilyn Monroe in pen and ink. I’ve been practicing pen and ink portraits lately. I find them uniquely challenging. Some I’ll post and some I won’t, but this one of Marilyn Monroe I decide to post. I’m fairly happy with it, but I didn’t nail it. I didn’t quite capture her essence the way I wanted. I liked the photo reference for the high contrast, which is conducive to pen and ink. Subtle shading is trickier than with pencil or paint. I have a tendency to overwork the piece. It’s been a pretty steep learning curve. Comments and critiques are appreciated. I realize this isn’t as wildlifey or woodsy as what I normally do, but it’s good to mix things up. Besides, there’s people in the woods too. Although, I’ve never run into Marilyn in the woods, but that would make a heck of a blog post! 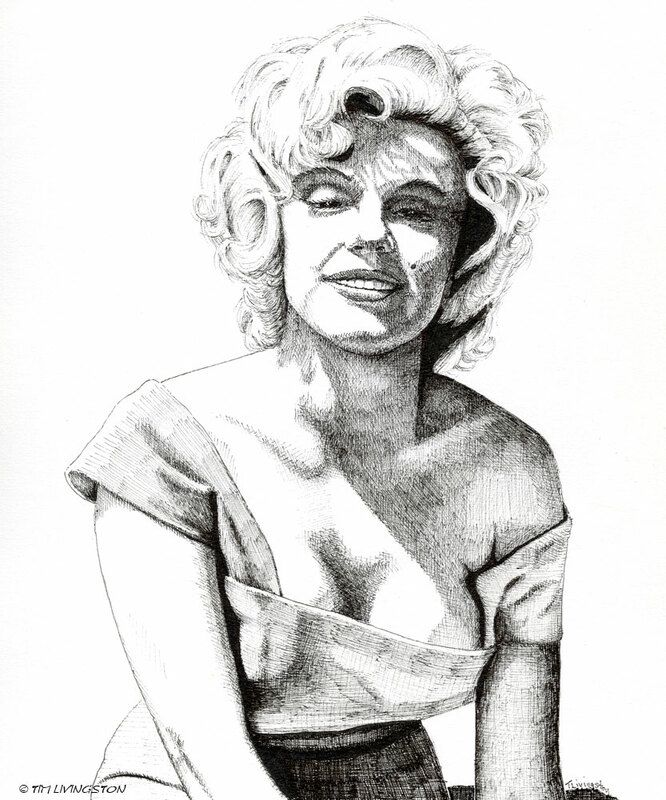 This entry was posted in Drawing, Pen and Ink and tagged art, Forester Artist, Marilyn Monroe, pen and ink, Pen drawing, portrait by foresterartist. Bookmark the permalink. You deserve to happy with this one! It is outstanding! I’m glad you think so Gail. Now if only I could do a nice one of Mary. That’s really been a struggle. Maybe I’m too familiar with my subject. Not being an artist myself, I can’t really comment on that, but maybe you’re being too hard on yourself? Your subject means so much to you that you’re being overly critical of your work? That’s nice of you to say, but I believe the longer I do this the more obvious it becomes when something isn’t quite right. It pushes me to improve and that’s a good thing. I think Marilyn would give a nod of approval! I know I do! I probably couldn’t do better than that, but since she’s not going to comment I’m just going to appreciate yours. Thanks Linda. Absolutely beautiful! It looks just like her! Thanks Joy! I’m glad you like it. Your work with a pen is fabulous and you do catch her allure awesomely. Awww…Holly, you are too kind. Thank you so much! Thank you Jim! I’ve really been enjoying your photography even when I haven’t commented. You do some amazing work. I had to restrain myself a bit. I’m sure Marilyn was used to that. I’ve done other portraits, not Marilyn, that I didn’t post. Some of those were pretty rough. Now, if I do run into Marilyn in the woods I’m going to show her that picture and get her opinion! getting such a range of tones in pen and ink is a real challenge, and I think you have done a great job! Thank you Anna! I appreciate that, and I’m going to keep practicing. Hard to critique–pen and ink humans can get kind of “scratchy” looking, especially photos of those ink drawings. I’m betting this one looks dynamite in person, standing back a few feet from it! Thanks for the feedback Alli! I think is does look better in person. I’ll being doing more so stay tuned. Time to up my game. I’m not sure how Marilyn Monroe really looks, so I’m not so much able to tell the difference, but hear this for me. This is very good. Very lovely. Thank you so much Esther! You are very kind.